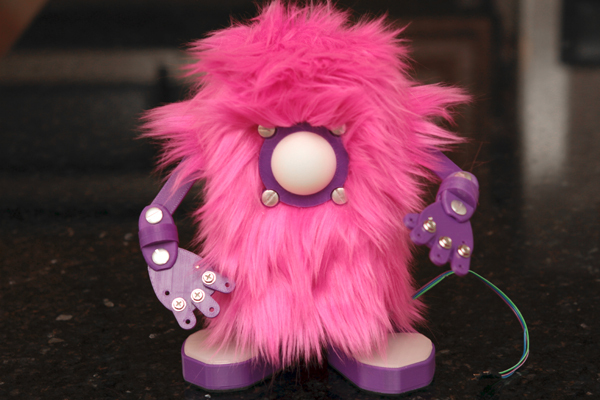 Here is a great project for your next hack-night… grab a couple friends and prepare to make a fun, furry, and fabulous monsterbot – meet Mopsey! What can this robot do? That is an excellent question… what would you like for it to do? Mopsey could wave her arms when you get a new tweet, turn her eye red when your website is down, or do both when someone opens the cookie jar. Robots will do whatever you tell them! I’ve prepared a repository that contains detailed photos of assembly, paper templates, 3D models for printing… all the goodies you’ll need to construct Mopsey. Have you used servos with Arduino before? If not, this link will get you up-to-speed with Arduino Servo Control. You’ll also need one library to drive the NeoPixel, which can be found in the Adafruit Learning System. Pink, green, blue... what's your favorite color? A yard of craft fur is a lot... be prepared for fuzzy bits to get everywhere - use a lint brush to tame this wild beast! Step #5: Was Very Fuzzy! The aluminum posts are a little soft... use the force wisely! Step #8: Eye Love You! Washers, sand, plaster of paris, BBs, small rocks... be creative! Add more hardware to expand Mopsey's capabilities! Has code in brain, soldering iron in hand, Art Blakey blaring in the background... transforms techno babble into reality and is strangely fond of the ellipsis.